Are you thinking about getting into project management? Or are you looking to grow your team from the inside? A project management apprenticeship could be the answer. The UK is big on apprenticeships right now, especially as the Apprenticeship Levy is now in force. It effectively means companies are paying for apprenticeship training whether they use it or not, so they might as well use it. But what if you don’t qualify, or aren’t based here? There are other apprentice schemes targeting project managers, and today’s interviewee knows all about them. 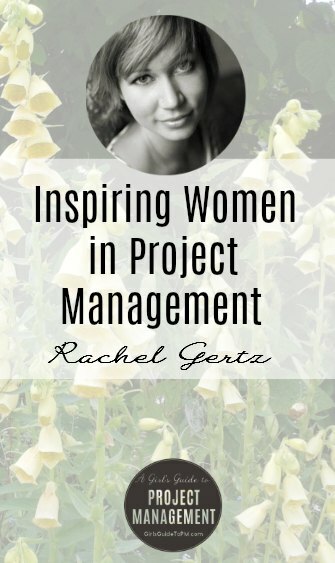 Rachel Gertz is a digital PM trainer who teaches apprentices and she’s passionate about supporting project managers and their creative teams. Rachel and I caught up so she could tell me more. Hello, Rachel. Let’s start at the beginning. I get that the apprentices learn and develop, but tell me what companies get out of project management apprenticeships. Companies who embrace apprenticeship are the champions that elevate our digital industry. Of course, first companies want to know about the cost savings. Trained apprentices in project management save companies money by acting as the nucleus of the team and its stakeholders while improving relationships and reducing overages on projects when catching and mitigating red flags. They also deepen relationships and establish clear boundaries around client communication and expectations. Our project management apprentices work and learn at the same time which means they can immediately earn full salaries, provide immediate value back to their organisations, and recoup their costs within their training period. Essentially, we’re talking about a cost-neutral program. Our PM apprentices are trained to track the value of their contributions, so we’ve been happy to report that past students have noted increased company revenue and decreased project drag, negotiated additional phases on large scale projects, and pushed back successfully on scope creep saving the cost of their tuition within the year. Not only this but they’ve reported adjusting their team’s approach to scoping, scheduling, and client management processes which have saved their companies thousands of dollars in operations. In Canada alone, a study reported that apprenticeships return nearly $1.50 for every dollar spent on an apprentice. Not too shabby! Well, that’s appealing. But I’m guessing it’s more than getting staff trained in a cost-effective way? Apprenticeships create a culture of learning and professional development which has rippling effects on process and productivity within the companies that host them. Apprenticeships create a culture of learning and professional development which has rippling effects on process and productivity within the companies that host them. They also create happier employees: staff are more likely to invest time and attention to improving processes and improving projects while lowering team onboarding costs and improving talent retention (more on that in this article on the cost of team debt). Apprentices are the unsung heroes who keep their organisations open to learning and focused on continuous improvement, a practice which elevates us all. Apprentices come from diverse backgrounds, don’t they? Apprenticeships promote inclusive teams by widening the talent pool to include people who may not normally have access to specialised employment opportunities. Apprentices may have diverse skills and employment backgrounds that enable them to be effective project managers, yet most job postings for a PM position require a minimum of three years experience which prevents many applicants from getting a foot in the door. According to McKinsey, diverse teams are more efficient, and should be the default when organisations make hiring decisions. What’s it like in creative agencies? Often PMs in creative agencies work in silos without a community to support real time learning or provide emotional support. However, we see more communities springing up to support and connect project managers around the world. This program is an extension of that desire to connect and improve our practices together. We hope that others start thinking about ways they can apply an apprenticeship program model to design, content, and development (and maybe other industries, too). We are better and stronger when we work together. We believe it’s our only shot at getting through this weird future intact. OK, so what makes digital different? First, let’s talk about technology in general. Technology is sweeping over every single industry and is fundamentally changing the way humans interact and solve problems together: automating feedback, shortening the learning and on-boarding cycles, not to mention revolutionising our tools to provide great transparency and collaboration between stakeholders. This is radically changing project management approaches and outcomes. Rigid bodies of knowledge will be forced to adapt to keep up with this pace as work culture and job roles shift. In other words, we need to think differently about the way we do project management. Project management requires a supreme amount of emotional intelligence and critical thinking. This role will be one of the last to be automated as artificial intelligence and machine learning creep up the employment ladder. We aim to train capable project managers who can anticipate and respond to these impending changes. We’ll teach them to use their applied knowledge and skills to prepare for an uncertain future, one where our global challenges are waging a battle against the technologies we’re developing to solve them. 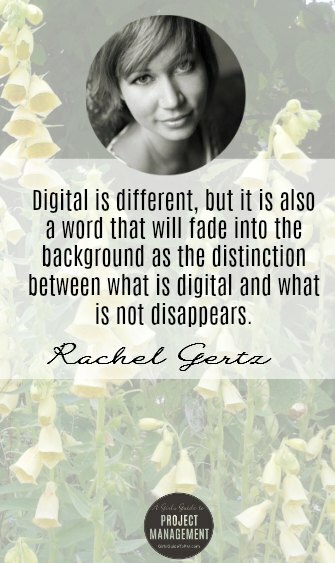 Digital is different, but it is also a word that will fade into the background as the distinction between what is digital and what is not disappears. Your apprenticeships tap into this. Tell me more about how they work. We deliberately set up the program in a way that would allow apprentices brand new to PM to contribute immediate value as coordinators and administrators. And if they’re improving their current PM skill set, apprentices can immediately apply skills from each session to new projects as we teach both the soft and hard skills involved while letting them gain practice on simulated projects in a safe environment. Technology frees up the traditional apprenticeship model in that it allows our trainers to teach students anywhere in the world while using tools that promote open collaboration. This lets us circumvent the traditional internship or co-op model (where students would first take classes within a school building and then enter the work environment). We do all this remotely while our apprentices work full time in their company. We’re excited about the program format as we believe it’s the first of its kind in the world. So how did you get involved in all this? Tell me about your background. I began my career in education. I taught kids from ages seven to 17 during my educational practicums. When I finished there was a three-year wait list to teach full-time, so my partner and I decided to escape suburbia and do things our own way. Instead of a nine-to-five, we learned to run a remote digital studio while freelancing our way around the US in a Winnebago. From there we started testing and experimenting with processes and found a way to turn our love of teaching, design, writing, and project management into something that we believe helps address major challenges like employment and access to employment opportunities in our world. This evolved to our current project management apprenticeship program. And what role do you have now? We’re a small company, so I currently wear a mess of hats: training, sales, marketing, operations, project management etc. Over the next few years we plan to carefully build Louder Than Ten by hiring a handful of savvy trainers so we can stay small and adaptable. We are committed to closing the skills gap in our industry by training and connecting smart project managers with people-first organisations and build more inclusive teams. As we grow, we’ll likely develop a product management stream to prepare for the growing number of companies facing a product manager shortage. In the near future my role will gradually shift and I’ll likely be doing quite a bit more speaking, writing, and trainer training, but I’d also like to prioritise partnerships with groups who support underrepresented and impoverished individuals so we can connect them with people first employers. Besides that I’d also probably volunteer to try out that Neuralink device Elon Musk is rolling out (I just don’t want to be the first or tenth person to try it). 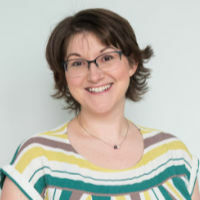 About Rachel: Rachel Gertz is the Co-founder at Louder Than Ten and a Digital PM Trainer. She trains apprentices in digital project management so they can keep their companies happy, healthy, and ready for the future.